The minute I started working with Waldo I knew he was going to be successful at transforming his body in my 12 week program. He was very dedicated to my workout and nutrition programs from day 1, dropping from 22% body fat to 12%. His waistline shrunk from 34 inches to 30 inches and chest size rose from 37 to 40 inches. Waldo continues to train with me and has in the process run the NYC, Paris, Boston and Chicago marathons. Proof that with the right amount of discipline and passion you can have it all. Congrats Waldo! Mike’s adherence to my 12 week program was one of total dedication and discipline. In addition to the nutrition program I prescribed for him and the workout program designed, he complemented his lifestyle program with the necessary cardio activity and supplements I recommended for him. His intensity in the gym was one of pure focus, high energy and enthusiasm always visualizing a better and stronger physique during and after each workout. He lost 4 inches off his waist and added 3 inches to his chest and 2 inches to his arms. Congrats mate. Stay tuned for more progress pics from Mike soon! In 12 weeks Brendan lost 3 inches off his waist, gained 1.5 inches on his arms, 2 inches on his chest and quads and went from 23% to 12% body fat. What impressed me most about Brendan was not only his consistency and discipline to the workout and nutrition program I prescribed but his amazing ability to adapt and fight for each workout I gave him which always kept him guessing and challenged him mentally and physically at the same time. I trained and coached Juan for 12 weeks in the lead up to his very first natural physique show and got him into the best shape of his life. We worked on bringing out his back width, posing presentation and choreography and getting his physique as lean and muscular as possible. Juan came in 3rd. A fantastic first time effort! I coached Sarah both in person and online for over 6 months. These photos show her progress over a period of only 6 weeks. She came to me wanting to get in the best shape of her life for her second year of figure shows in Australia. My program with her included prioritizing her workouts so she trained her back and shoulders with more energy and volume in order to enhance her symmetry and balance. I also worked on ensuring her leg program was one that enabled her to achieve a leaner and more defined lower body. Throughout the lead up to her show we Skyped weekly and went through her posing and stage presence skills which was one of the deciding factors in her being so successful in her 2016 season of INBA figure shows. Coaching Megan online for the last 12 months has proven to be a great success for her and very rewarding for myself. She lost a total of 77 lbs of body fat and as you can see looks amazing. It changed her life in such a positive way that she decided to change her career path and is now a personal trainer and transformation coach. Freddy Washington was able to lose 25 pounds of fat, reduce his waist size from 34 to 30 inches and increase his arms from 15 to 17.5 inches all in the space of 9 weeks. His body fat percentage dropped from 24.2% to 15% and his Powerpose technique, strength and endurance all improved dramatically over this period. He is now able to adopt the Ferra Fitness principles of health and fitness that we have instilled in him and continue to live a happy and successful life. Rising NYC actor Daniel Bateman has packed on 25 pounds of quality muscle in 20 weeks. He has proven that at 6’3 and 20 years of age it is possible to transform your body. Daniel’s arms have increased from 12 to 16 inches and his chest has gone from 37 inches to 42 inches. Not only does Daniel have more strength and a better body his confidence has soared as well. He is now booking more acting roles and forming more meaningful relationships as a result of his renewed positive outlook on life. With Gennaro’s specific bodypart blaster and Powerpose® routines coupled with his food delivery service, Daniel was able to achieve the body he never thought possible. This before and after video and testimonial says it all. The best is yet to come! John came to me not having worked out in over 10 years. At 32 he was frustrated and lacked direction. Within two weeks John's strength was up considerable and he was beginning to shed fat and build muscle. By week 12 John had lost 5 inches of his waist, gained 2 inches on his arms and lost 10% bodyfat. He felt his customized easy to follow nutrition plan complemented his workouts perfectly and enhanced his strength training and his physique. In 20 weeks Daniel’s Body fat went from 28% to 12%. His waist size dropped 5 inches in that time and arms increased 2 inches each. That’s great progress at a height of 5’6. His commitment to my 12 week customized nutrition and workout program enabled him to lose unwanted body fat and increase muscle size in a very short time. His bench press went from 125lbs for 10 reps to 230lbs for 10 reps in just 5 months. I utilized his strengths and former skills in gymnastics to have him perform a lot of pull ups, pushups and other body weight exercises that sped up his metabolism and make him appear wider and leaner throughout his back, shoulders and chest. His dedication and consistency to my nutrition, cardio and bodybuilding program was the key to him leaning up fast. Stay tuned for more great work from Daniel. I trained Rhiannon for 8 weeks leading up to her first ever Figure NPC Atlantic States Championship show in which she paced 3rd. We paid special attention to her legs and establishing a lean and toned body which she achieved. In addition to training her for the show I coached her on stage presence and posing and she took it naturally. She was able to project grace, confidence and displayed great posing ability while on stage which helped her place high in her first show. With the confidence and belief that she is a winner attitude she was able to present a very polished, professional, competitive and fun package that gave her the ability to maintain that winning attitude. Celso has made one of the fastest and most impressive body transformations thus far. I have worked with him for 7 weeks now and in that time he has lost 24 pounds of body fat. At 5’10 he now weighs 177 lbs down from 201 lbs. His body fat went from 32% to a current 22.8% and he lost 7 inches off his waist. We can all learn from Celso’s dedication and commitment to a healthier lifestyle and quest for a great body and strong mind. Celso never missed a beat in the time I worked with him. He performed every single workout prescribed, did all the necessary aerobic training and ate super clean and lean and continues to do so. His passion and motivation was not only fueled by the desire to have a better body but the desire to have it now as he rewards himself on a two week vacation in a beautiful sunny part of the world. In 12 weeks Nina lost a total of 19 pounds of body fat. She lost 4 inches off her thighs, 4 inches off her hips and 3 inches off her waist. She went from hardly being able to do 1 pushup to be able to perform 4 sets of 15 with ease. She was always up for a new challenge and never complained as the workouts got harder and more intense. Our workouts were extremely fast paced requiring a lot of muscular endurance and strength which Nina developed over the course. Her ability to execute my Powerposes® between sets was impressive and enabled her to lean out even more enhancing her flexibility, balance and coordination. Nina’s goal is to continue sculpting and improve on the great shape and strength she has achieved thus far. Congratulations Nina. You make my work a pleasure. Joe has made great progress in achieving a look for film and TV that would make any action film director hire him. This transformation took place over a period of 4 months and during that time Joe trained with me 3-4 days a week consistently. Joe’s goal now is to pack on an additional 10 pounds of muscle while maintaining his beautifully defined and sculpted physique. Serena has shown once again that with the passion, dedication and will to succeed one can achieve a great body and optimal health in a short amount of time. I have been working with Serena for 10 weeks now and in that time she has lost 39 pounds of body fat. At 20 years of age Serena displays an enormous amount of discipline and consistency which has paid off. She is hungrier than ever now to define her physique and shed another 15 pounds of bodyfat. With the focus, intensity and hard work she brings to every workout we both know she will achieve her peak condition in no time. Congratulations Serena. You make me proud! 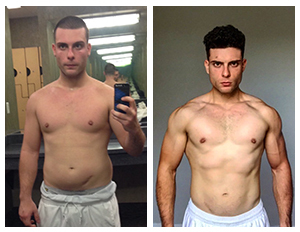 After coaching Brent for 3 months I transformed his body from pudgy to lean and muscular. In this time Brent lost 20 pounds of fat in 12 weeks and his bench press sky rocketed from 135lbs to 255lbs for 4 reps. His squat poundages also increased dramatically from 145lbs to 315lbs for 6 reps. Brent did not hold back and as a result continues to stay in great shape and excel in fitness and life. I coached Scott for 6 months in the lead up to his natural bodybuilding show. This transformation took place over a period of 5 weeks as I prepared him for his show which he won. I was able to refine and define Scotts physique through analyzing his nutrition program on a daily basis and make the necessary adjustments to help him achieve his impeccable shape! From the very beginning of our fitness journey, and at 47 years of age, Alan displayed a determination, discipline, and passion that led him to the point of feeling and looking the best he has in more than a decade. Alan came to me weighing 213lb’s with 33.5% bodyfat (9/12/08). After my 12 week program he now weighs 182lb’s with a bodyfat of 22.3% (12/15/08). He has lost 31 lb’s and 11.2% bodyfat and counting. His waist measurements shrunk from 40.5 inches to a current 35.5 inches. That’s a 5 inch loss! Alan’s midsection was one of his biggest problem areas and we attacked it with a sensible and safe core training and Powerpose program which I incorporated in all of his workouts. With my program Alan was able to lower his cholesterol by 40 points. Angelo came to me soft and out of shape. At 42 years old he hadn’t exercised in over 10 years and his energy levels and self esteem were low. In 12 weeks Angelo lost 16 pounds of body fat and at 5’8 he now weighs 144 lbs. His waist shrunk from 36 to 31 inches and his strength and endurance have soared as a result of our intense strength training program and his dedication to the nutrition program. Angelo has joined my elite group of clients that have excelled and exceeded expectations. Gennaro boosted me with the confidence I needed for my first figure competition. I attempted training on my own, as I thought I had it all together with the workouts and diet. However as the competition got close, I began to panic, realizing I was not at all prepared with the posing. I needed a coach. Only a couple sessions with Gennaro accomplished this. He had me so focused, I soon forgot only moments before how self conscious I was strutting around an over-crowded gym clad in nothing but a bikini and sky-high heels! Peter Baldassari has made a remarkable transformation. At 5’7 Peter weighed 195 lbs with 20% bodyfat when first starting with me. After 12 weeks on my customized nutritional, cardio, Powerpose and resistance training programs he went down to 172lbs with 12% body fat. Peter’s core strength and muscular power increased and he has more agility and endurance than ever before. Oh… and he looks great as well. At 41 Peter is living proof that you can still attain a 30 inch waist. Congratulations Peter! Bong Ian‘s 12 week transformation is an incredible one. He first contacted me via email and since, Ive been working with him online via my online coaching program.designing all his nutritional, workout and supplemental routines. Peter Gregus is a broadway performer and can be currently seen in The Jersey Boys as Bob Crewe. When coming to me, Peter had a specific goal in mind and that was to be in the best shape of his life for the Broadway Bares Show. Peter 40, and 5’10 commenced my 12 week course weighing 175lbs with 20% bodyfat. After the completion of the course he gained 10 lbs of muscle and lost 10% bodyfat. Due to tours and his busy schedule, Peter is now working out on his own using my lifestyle principles to guide him to maintain what he worked so hard to achieve. Well done Mate! John Jelich has been working with me for over a year and a half. He started out 317lbs. and is now 185lbs. At 45, the process of body development takes longer, but John is achieving the goals that he established for himself. He is a prime example of what can be done with the proper motivation.